While it is primarily seasonal H3N2 influenza that has North America in its grip on this frigid first day of the new year, elsewhere across the Northern Hemisphere the story varies - from H1N1pdm09 in Africa and parts of Asia, to Influenza B in China. All three subtypes can produce serious epidemics, but the H3N2 virus has a history of being particularly hard on those over 65. Add in a less-than-stellar vaccine this year, and you can understand why five days ago the CDC issued a HAN Advisory: Seasonal A(H3N2) Flu Activity & Antiviral Treatment of Patients with Influenza. An overview of global flu conditions from the World Health Organization shows us the variety in subtypes, and intensity, across the Northern Hemisphere as of early December. Influenza activity continued to increase in the temperate zone of the northern hemisphere while in the temperate zone of the southern hemisphere activity decreased at inter-seasonal levels. In Central America and the Caribbean, influenza activity remained low. 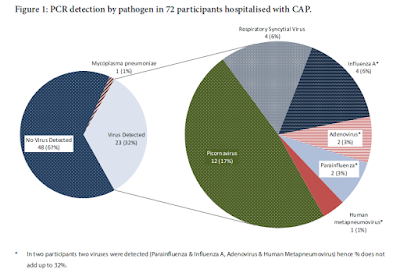 Worldwide, influenza A(H3N2) and B viruses accounted for the majority of influenza detections. In North America, overall influenza activity continued to increase in the region, with detections of predominantly influenza A(H3N2) viruses. In Europe, influenza activity continued to increase, but remained low in most of the countries, with detections of predominantly influenza B followed by influenza A(H3N2) viruses. In Western Asia, elevated levels of influenza activity were reported in in recent weeks, with influenza A(H1N1)pdm09 predominantly detected. In Central Asia, low to no influenza activity was reported. In East Asia, influenza activity remained low in most of the countries with the exception of China where influenza like illness (ILI) and influenza percentage positive continued to increase, with influenza B Yamagata-lineage viruses predominantly detected. In South East Asia, low levels of influenza activity were reported. In Southern Asia, influenza activity remained low in general. Detections of influenza A(H1N1)pdm09 and A(H3N2) viruses were reported in India and of all seasonal subtypes in the Islamic Republic of Iran. In Northern Africa, low levels of influenza activity were reported. Detections of influenza A(H1N1)pdm09 virus increased slightly in Tunisia. In Western Africa, influenza virus detections were reported in Burkina Faso, Ghana, and Sierra Leone, with influenza A(H1N1) pdm09 virus predominating. In Middle Africa, sporadic detections of influenza A were reported in Cameroon. In Eastern Africa, influenza A(H3N2) and B detections were reported in Madagascar and Mozambique. In the Caribbean and Central American countries, respiratory illness indicators and influenza activity remained low in general but respiratory syncytial virus (RSV) activity remained high in several countries. In the tropical countries of South America, influenza and RSV activity remained at low levels overall. In the temperate zone of the Southern Hemisphere, influenza activity decreased overall to inter-seasonal levels. National Influenza Centres (NICs) and other national influenza laboratories from 106 countries, areas or territories reported data to FluNet for the time period from 27 November 2017 to 10 December 2017 (data as of 2017-12-22 01:31:51 UTC).The WHO GISRS laboratories tested more than 127006 specimens during that time period. 15344 were positive for influenza viruses, of which 9579 (62.4%) were typed as influenza A and 5765 (37.6%) as influenza B. Of the sub-typed influenza A viruses, 1596 (30.1%) were influenza A(H1N1)pdm09 and 3698 (69.9%) were influenza A(H3N2). Of the characterized B viruses, 2640 (85.2%) belonged to the B-Yamagata lineage and 460 (14.8%) to the B-Victoria lineage. As you can see, H1N1pmd09 continues to dominate in Northern and Western Africa, and Southern Asia. And recent media reports out of Pakistan suggest they are seeing a surge in hospitalizations, and deaths (see Seasonal influenza claims four lives in Multan | Pakistan). In Southern Asia and parts of the Middle East H1N1pdm09 is still regarded by many in the public (and is perpetuated by an often hyperbolic media) as posing a much greater public health threat than `seasonal flu' - even though it has been declared a seasonal flu since 2010. That, perhaps combined with New Year's being a slow news day, may explain the dubious headline and story that has splashed across Pakistani and International media sources today claiming the WHO has declared the recent rise in H1N1pdm09 activity in Pakistan a PHEIC (Public Health Emergency of International Concern). PESHAWAR: The World Health Organisation (WHO) has declared outbreak of human cases of influenza A/H1 N1 a public health emergency of international concern (PHEIC) under IHR 2005 in Pakistan. A big story . . . were it true. But the issuing of a PHEIC requires the convening of a meeting of their IHR Emergency Committee, something that would have been publicly announced days in advance, and the issuance of a PHEIC would do absolutely no good if the WHO didn't publicize it. Neither of which, as far as I can tell, has happened. A bit mystified by the precise wording in the media reports, I managed to track down a Dec. 26th statement from Pakistan's NIH that appears to have sparked this rumor (see below). WHO declared outbreak of human cases of Influenza A/H1 N1 Influenza a Public Health Emergency of International Concern (PHEIC) under IHR 2005. During August 2010, WHO affirmed H1N1 post pandemic phase and declared it as a seasonal flu virus. It has also been observed that the virus activity is continuously enhancing in South East Asia including Pakistan, with all seasonal influenza subtypes present in the region. Influenza viruses belong to Orthomyxoviridae family of viruses. There are 3 influenza virus types (A, B, C) in which types A and B are important for humans. Type A viruses cause highest morbidity and mortality. Seasonal influenza is caused by a number of circulating Influenza viruses such as Influenza-A (H1 N1, H3N2, H2N2) and influenza B etc. The Pandemic Influenza A (H1 N1) pdm 2009 virus continues to circulate causing outbreaks of seasonal influenza in neighboring countries of Pakistan. Clearly (well, upon the third reading, anyway) the reference to a PHEIC is from the 2009 declaration, followed by the decertification of H1N1 as a pandemic strain in 2010. What appears to have been meant to be a brief history of the virus seems to have been taken as new declaration by the media. Breaking that opening paragraph (of 145 words) up into at least four paragraphs helps convey the message a lot. A communications technique that most web writers have embraced, but continues to elude far too many professional scriveners. There is a point to all of this, besides trying to quash a rumor before it becomes accepted as `fact'. While media reports can be useful in the hunt for infectious disease reports, they aren't always the most reliable source. Most reporters are generalists - and their knowledge of science and infectious diseases is limited. Some are working an `angle' that fits their personal or their paper's agenda. Even when they get the story mostly `right', the headline is usually written by an editor who is primarily interested in attracting the most `eyeballs' to the story. Which is why I try to use official sources (which, admittedly can be wrong or misleading, too) for this blog whenever I can. The fewer `filters' a story has to go through, the less embellishments that are likely to seep in. Media reports can (and often do) provide leads, early hints of outbreaks, or other valuable information. I'd never have checked Pakistan's NIH for a flu statement had I not read the PHEIC report in the media. I scan hundreds of media reports every day, and they often send me down the rabbit hole, looking for official confirmation or corroboration from other sources. The `echo chamber' mentality on the interent, however, doesn't make finding multiple reports necessarily convincing. I do use media reports (with appropriate caveats) if no official source is available, or to provide additional background for a verified outbreak. And there are a handful of science writers/reporters (i.e. Maggie Fox, Helen Branswell, Kai Kupferschmidt, etc.) that I trust to get it right. While I try to be as accurate as possible, I've been stung a few times over the years by plausible sounding media reports that turned out not to be true. Hopefully it happens less often now, than when I started this blog 12 years ago. But it can still happen. For those reasons, the old adage applies; Caveat Lector. Even when you read it here.